1. 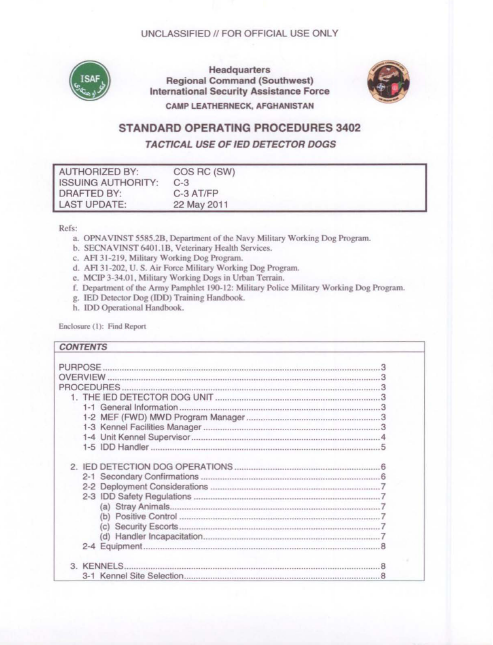 To issue policies and procedures, provide guidance, and set standards for the administration and operation of the Improvised Explosives Device (IED) Detector Dog (100) capability in Regional Command (Southwest) (RC (SW)) during Operation Enduring Freedom (OEF) in accordance with (IAW) References (Ref) (a) through (h). 1. This Standard Operating Procedure (SOP) provides guidance in order to (IOT) provide Counter-IED (CIED) combat support to forward deployed units involved in combat operations, stability and support operations (SASO), and Anti-Terrorism/Force Protection (AT/FP). 1. THE IED DETECTOR DOG UNIT. 1-1 General Information. Only Field Support Representatives (FSR), school-trained IDD handlers, and Kennel Supervisors (KS) are authorized to train, maintain, and employ the 100 in support of (ISO) combat operations. 1-2 Marine Expeditionary Force (Forward) (MEF (FWD)) Military Working Dog (MWD) Program Manager (PM). a. General Information. The MEF (FWD) MWD PM is the advisor to the RC (SW) C-3 on MWD/IDD concerns and is the point of contact (POC) in theater for unit KS to address MWD/IDD matters. In this SOP, “MEF (FWD)” is used interchangeably with “RC (sw)n.
(1) Document and track MWD/IDD support operations and provide required reports to RC (SW) C-3, United States Forces-Afghanistan (USFOR-A), and Marine Central Command (MARCENT). (2) Establish proper kenneling, feeding, and veterinary care for all MWDs and IDDs located within RC (SW). (3) Provide necessary materials, training, equipment, and supplies for MWD/IDD teams supporting combat operations and camp security. (4) Perform as liaison with every Battalion (BN) KS to ensure proper employment and maintenance for all MWD/IDD teams within RC (SW). (5) Track all incoming and outgoing units for MWD/IDD movement and arrange veterinary checks, Reception, Staging, Onward-movement, and Integration (RSO&I) training, reset training, and timelines for movement to unit positions. 6·8 Serious Injury or Loss of an 100.
a. In the event of a serious injury, the U.S. Army veterinarian shalf submit a report summarizing hishler findings and evaluation of the 100 injury to the 100 PM at RC (SW). b. In the event that negligence or criminal activity is suspected as the cause of injury or loss, a preliminary investigation will be conducted by CID or a designated third party. c. Negligent dog injuries are punishable under the Uniform Code of Military Justice (UCMJ). (1) Article 134: Abusing a public animal. (b) That, under the circumstances, the conduct of the accused was prejudice to good order and discipline in the armed forces or was of a nature to bring discredit upon the armed forces. i. Explanation: A public animal is any animal owned or used by the United States; an animal owned or used by a local or State government in the United States, its territories or possessions; or any wild animal located on any public lands in the United States, its territories, or possessions. ii. This would include, for example, drug detector dogs used by the government. (2) Article 108: Destruction of Government Property. (a) -Any person subject to this chapter who, without proper authority. iii. Willfully or through neglect suffers to be lost, damaged, destroyed, sold, or wrongfully disposed of, any military property of the United States, shall be punished as a courtmartial may direct.